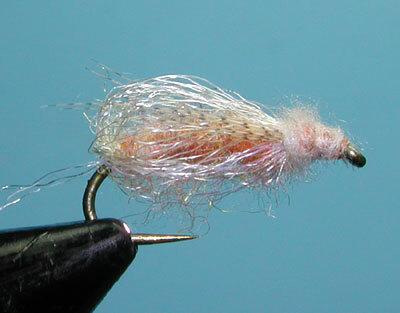 Notes: This pupa pattern was developed by Gary LaFontaine around 1974 subsequent to a three year period in which Gary used Scuba gear to study caddis within the Big Hole River of Montana. 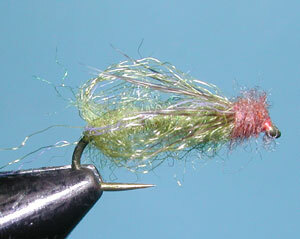 This fly pattern represents the caddis once it is in the surface film. Gary noticed that caddis pupa were vulnerable only when the pupa was cutting itself free from it's cocoon and under the surface layer where it splits it's pupal shuck. Gary found that only rarely will a trout feed or chase the pupa during it's time of ascent. When the caddis pupa cuts from it's cocoon, there is a 15-20 second period in which the pupa drifts along the bottom generating gas to fill the sheath around it's body. This gas produces a shimmering effect to the pupa. The ability to mimic this shimmer was critical to Gary's pattern and he accomplished that effect by using Antron fibers developed by DuPont in 1973. Antron is a trilobal fiber-yarn that is resistant to matting and has the ability to hold air bubbles within water. By utilizing the Antron for the underbody and a sparse overbody, Gary was able to accomplish the gas-attracting qualities of the fly and the translucency required. . 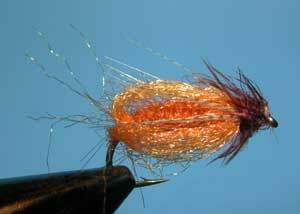 The Deep Sparkle Pupa is designed to mimic the caddis pupa while it is still on the bottom, drifting. Gary had four main color variations that he used for the body/underbody: 1) Brown/Yellow 2) Brown/Bright Green 3) Ginger/Ginger 4) Dark Gray/Dark Gray . He also used Brown/Orange in a size 8 for the October Caddis hatch.The original Sparkle Yarn that Gary used was a blend of a particular color and clear Antron. Clear Antron is no longer available, so many tiers will create a blend using White Antron. Eric Slagle, a quide from Montana, wrote an excellent article on using color blends of Wapsi Antron Sparkle Dubbing in Fly Tyer , Spring 2006. He would use this material for both the Overbody and Underbody. Although Gary used lead wire to weight his Deep Sparkle, heavier hooks are now available to accomplish the same thing. You might consider using a TMC 3761 or equivalent to get the necessary weight without adding the bulk of lead wire. My preference is to use blended Antron Yarn for the overbody and Antron/Superfine Dubbing Blend for the underbody. You'll find that the yarn is much easier to work with in creating the veil. 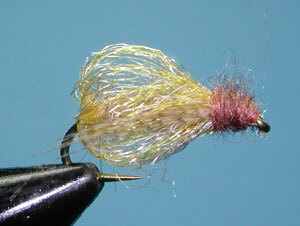 Gary did not use a trailing shuck on his original Deep Sparkle Pupa. 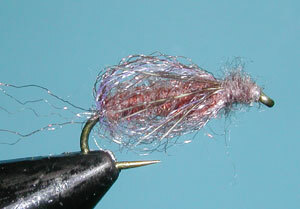 Some fibers will break away from the overbody to create a shuck effect and this is acceptable, as the caddis is in the process of emerging from it's shuck. Ralph Cutter, a local guide out of Nevada City, finds that the Brown/Bright Green color pattern seems to outperform the other color variations within the Sierras.